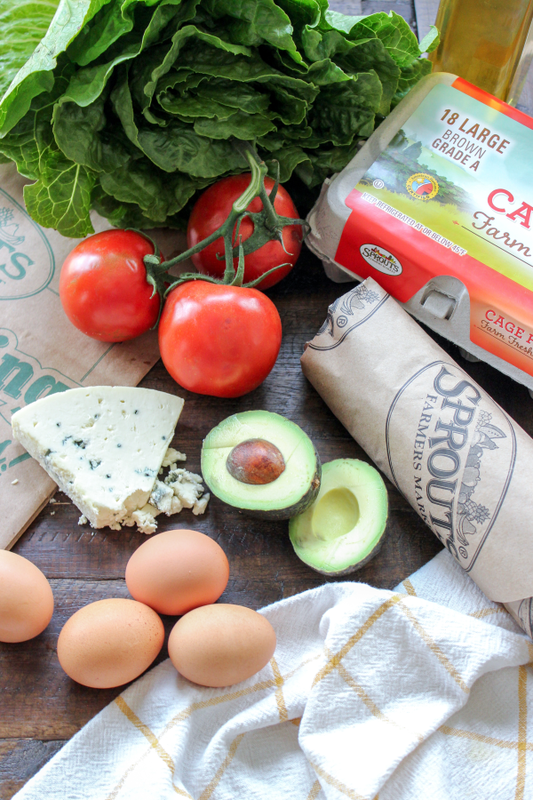 This recipe was created in partnership with Sprouts Farmers Market. All opinions are my own. I would definitely qualify myself as a veggies lover. I enjoy snacking on fresh cut up veggies throughout the week, eat them grilled as a side with dinner, or cooked with eggs for breakfast. But, I’ve never been the type of person that craved salad… Does anyone genuinely crave salad? Fresh ingredients are a must! I need to feel genuinely satiated after eating. This usually means it needs to have meat and cheese and other yummy things to counteract the fact I am chewing lettuce. Homemade dressing when possible. It’s easy to make and it just tastes better. 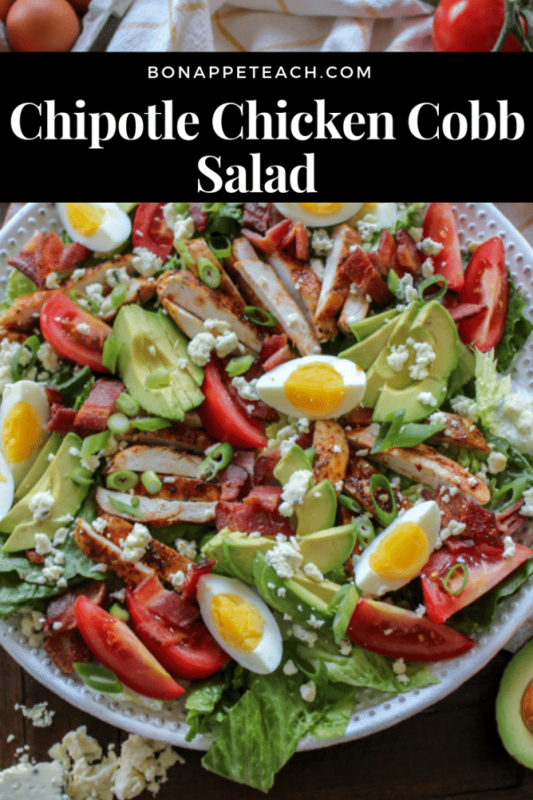 Now that we got all of that out of the way, I cannot wait to share this easy chipotle cobb salad I made this passed week using ingredients from Sprouts Farmers Market. It took only 20 minutes to throw together from start to finish and hit all four of my dinner salad expectations and then some. 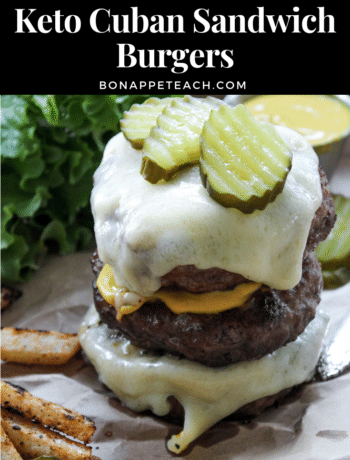 Find the full recipe below and read on for tips and tricks! I started with my base, the lettuce. When I eat a salad, I really prefer romaine or green leaf lettuce. I used a large head of romaine that I purchased from Sprouts. It was fresh and crisp and I wanted to keep it that way! Because salad takes very little technical skill to make, my biggest tip is to not chop your lettuce. That’s right… don’t chop it, but tear it instead. Tearing the lettuce leaves, releases less water naturally and prevents the salad from getting soggy. 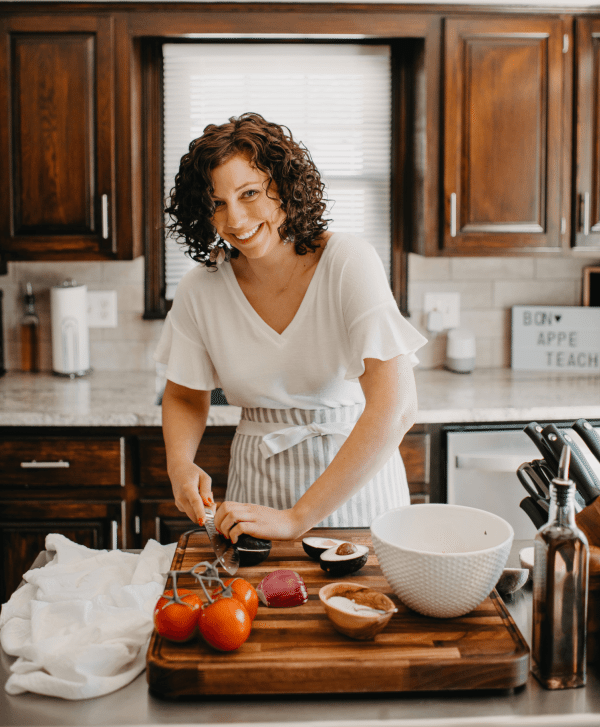 This is especially important if you want to use the salad for multiple meals or for meal prep! 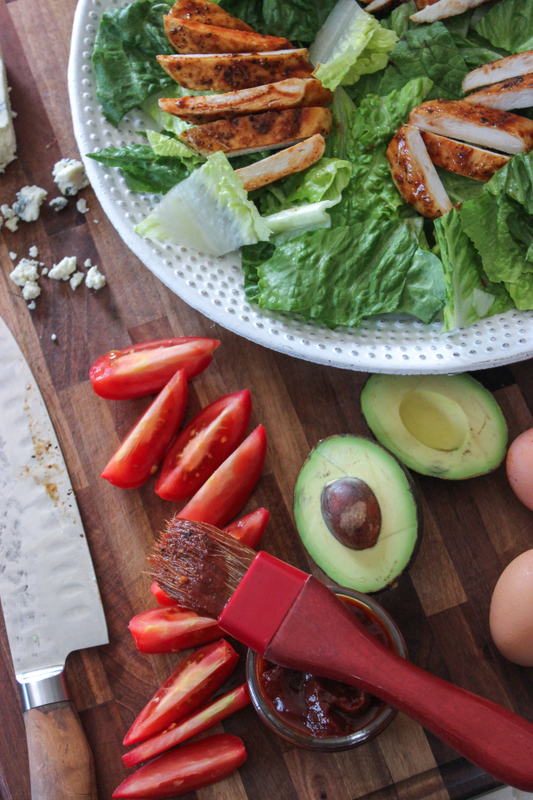 Overall, I kept the recipe ingredients for a typical cobb salad pretty standard. I used a thicker cut applewood smoked bacon I found (I obviously ate a few pieces before adding it to the salad…because that’s what normal people do). Additionally, I added in some hard boiled eggs, freshly crumbled blue cheese, green onion, sliced tomato wedges, and avocado too. To add some spice, I used a few tablespoons of the adobo sauce from the can of chipotle peppers to baste the chicken before and after grilling. 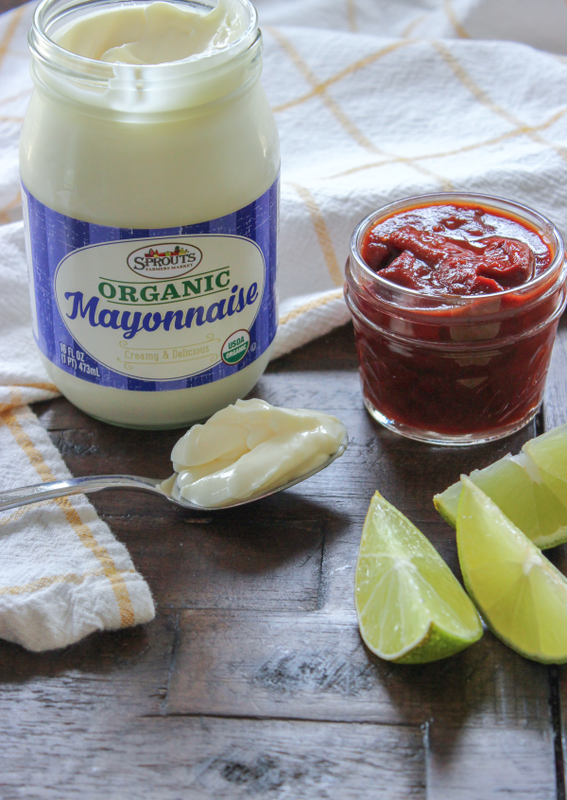 I also used the peppers and sauce to make an easy and low carb chipotle mayo dressing to tie the entire salad together. Layer and pile all the ingredients on! I like to sprinkle on the bacon and blue cheese last to look like a garnish. Drizzle on the dressing and serve it up! 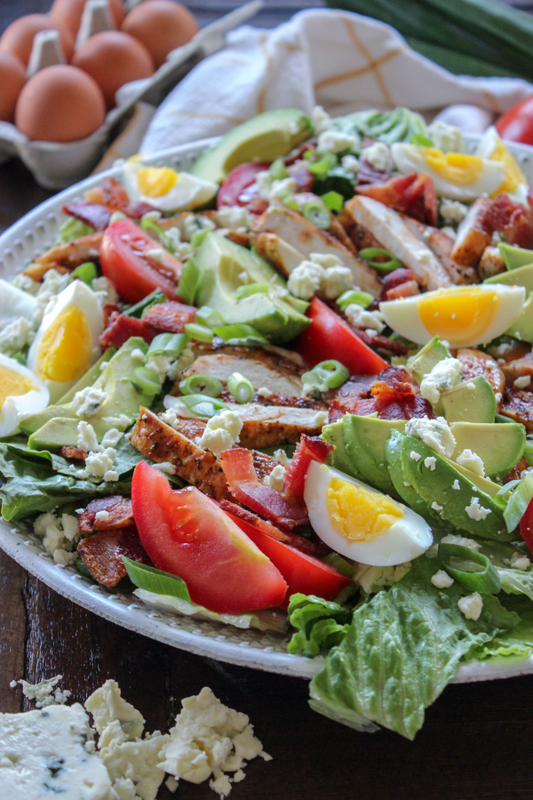 This easy to make, smoky chipotle Cobb salad is the perfect recipe for spring! 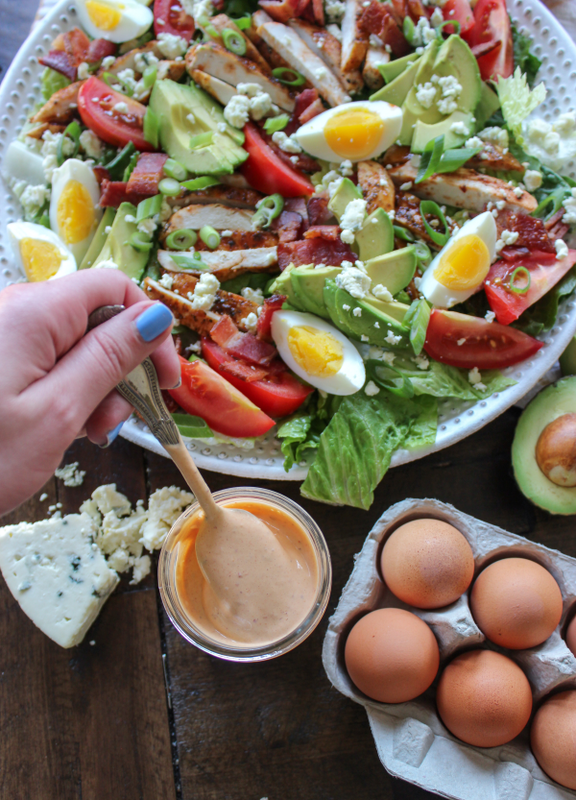 Toss all your Cobb salad favorites together and add the homemade chipotle mayo dressing to bring it all together. Begin by butterflying your chicken breasts in half. Preheat a grill or cast iron skillet to medium heat. While preheating, season the chicken with salt and pepper and lightly oil the outside of the chicken. Cook the chicken until it reaches and internal temperature of 165 F. Cooking time may vary slightly depending on the thickness of the chicken breast (about 3-4 minutes per side). Before removing the chicken, baste each side with some of the adobo sauce from the can of chipotle peppers (about a tablespoons per side). Set the chicken aside to rest before slicing. While the chicken in cooking, prep the salad ingredients. Tear the lettuce, peel and slice the hard boiled eggs and tomato, and dice the green onion. Layer everything over the lettuce on a platter. Slice the chicken breast and add to the platter. 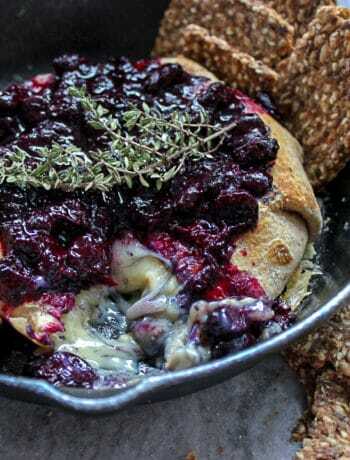 Top with crumbled, cooked bacon and the blue cheese.